428 pages | 9 Color Illus. | 227 B/W Illus. This book introduces readers to the structure and characteristics of nanomaterials and their applications in dentistry. With currently available implant materials, the clinical failure rate varies from a few percent to over 10 percent and new materials are clearly needed. Nanomaterials offer the promise of higher strength, better bonding, less toxicity, and enhanced cytocompatibility, leading to increased tissue regeneration. Mieczyslaw Jurczyk, director of the Institute of Materials Science and Engineering at the Poznan University of Technology in Poland, has drawn from work in his laboratory and elsewhere in Poland to show that nanomaterials have important biological applications including in the stomatognathic system consisting of mouth, jaws, and associated structures. The book is written from a materials science and medical point of view and has 13 chapters and about 400 pages. The book can be divided approximately into three sections: the first five chapters introduce nanobiomaterials, the next five chapters describe their dental applications, and the last chapters describe their biocompatibility. Chapter 3 is a compendium on metallic biomaterials such as stainless steel, cobalt alloys, and titanium alloys; bioactive, bioresorbable polymers; and composites and ceramic biomaterials. The "top-down" approach to producing nanomaterials such as high-energy ballmilling and severe plastic deformation, as well as Feynman’s "bottom-up technique" of building atom by atom, are discussed in the next chapter. Subsequent chapters discuss each material in depth and point out how new architectures and properties emerge at the nanoscale. Chapter 8 is devoted to shape-memory materials, which now include not only NiTi but also polymers and magnetic materials. In order to improve bonding, nanomaterials can be used to synthesize implants with surface roughness similar to that of natural tissues. Chapter 9 is devoted to different surface treatments for Ti-based nanomaterials, such as anodic oxidation to improve the bioactivity of titanium and improve the corrosion resistance of porous titanium and its alloys. The use of carbon in various forms—nanoparticles, nanofibers, nanotubes, and thin films—is discussed next with emphasis on the microstructure and properties of these materials, their implant applications, and their interaction with subcutaneous tissues. Nanomaterials can be used in preventive dentistry and therefore can reduce the amount of dental treatment that is necessary to maintain a healthy mouth as argued in chapter 11. In a subsequent chapter, the author explains osseointegration (direct bone-to-metal interface) from a biological point of view and early tissue response. The mechanism of the interaction between the implanted materials with the cellular protein in the tissues is described. The last chapter discusses the application of new nanostructured materials in permanent and bioresorbable implants, nanosurface dental implants, and nanostructured dental composite restorative materials. This book not only focuses on nanomaterials but also on nanoengineering to achieve the best results in dentistry. It is recommended to anyone interested in nanomaterials and their applications in dental science. People with a background in materials, chemistry, physics, and biology will benefit from it. "This book is the latest achievement by the school created by Prof. Mieczyslaw Jurczyk in the fields of nanomaterials and nanotechnology. 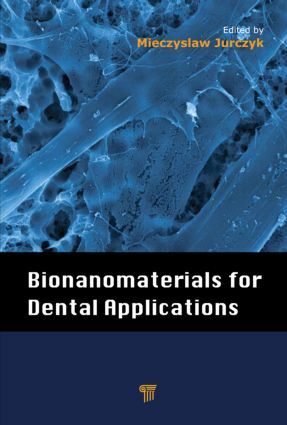 It is a compendium of the existing knowledge of bionanomaterials and bionanotechnology used for dental applications. An excellent reference for university teachers and students of dentistry and materials science and engineering, it represents a novel approach to materials used in dentistry and, thus, their future." "This book is a unique source of information on nanomaterials and nanotechnology, with a particular focus on bionanomaterials in dentistry. It is written by recognized scientists in the fields of both engineering and medical sciences. A substantial number of recent references make it valuable and inspiring for students and scientists in the field." "This book introduces readers to the structure and characteristics of nanomaterials and their applications in dentistry. Mieczyslaw Jurczyk, director of the Institute of Materials Science and Engineering at the Poznan University of Technology, Poland, has drawn from work in his laboratory and elsewhere in Poland to show that nanomaterials have important biological applications including in the stomatognathic system consisting of mouth, jaws, and associated structures. The book is written from a materials science and medical point of view. It focuses not only on nanomaterials but also on nanoengineering to achieve the best results in dentistry. It is recommended to anyone interested in nanomaterials and their applications in dental science. People with a background in materials, chemistry, physics, and biology will benefit from it." Mieczyslaw Jurczyk is a professor of materials science and engineering, the director of the Institute of Materials Science and Engineering at Poznan University of Technology, Poland, and head of the Division of Functional Nanomaterials. Jurczyk is the principal researcher in various research programs related to nanomaterials. In recent years, his research activity has been connected with two topics: (i) advanced nanomaterials for storage of hydrogen and (ii) advanced bionanomaterials and bionanocomposites for medical applications. He is the author of 250 scientific publications and 4 books.